Description Drawing the above flowchart demonstrates the use of the input and output shape. It is a parallelogram shape as shown below. In the chart above, the temperature is an input. Printing the results is an output. Some companies don't bother to to use the parallelogram shape and just use a standard rectangle. You should find out the accepted practice for your organization. The diamond shape shown below is a decision shape. It allows you to ask a question in a flowchart. It has one entry point at the top and can have up to three exit points. In the above chart, the question asked is "Is the temperature less than 32 degrees?" If the answer is yes, control flows out to the left following the line with the word "Yes" and if the answer is no, control flows to the right following the line with the word "No." 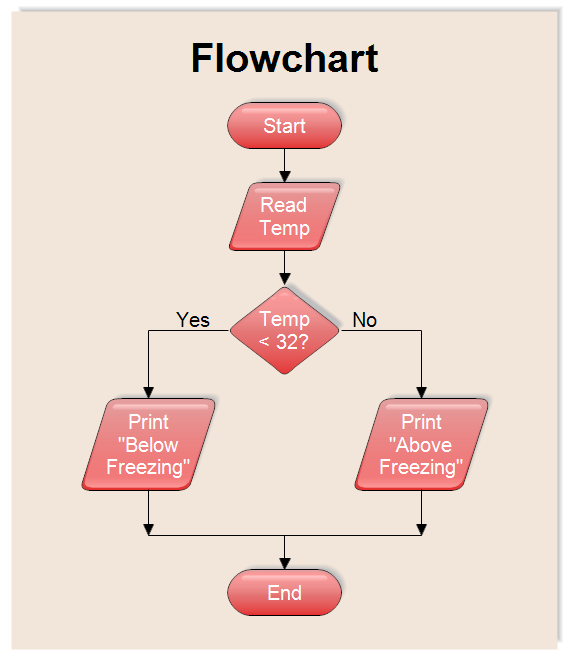 Once RFFlow is installed, you can open the above chart in RFFlow by clicking on flowchart_input_output.flo. From there you can zoom in, edit, and print this sample chart. It is often easier to modify an existing chart than to draw it from scratch.